Global Economy Matters: Is Japan Heading for a Recession? Is Japan Heading for a Recession? While financial markets are gazing firmly towards the US economy shadowing Ben Bernanke's every word and gesture for a hint of future rate decisions economic fundamentals in Japan are trending firmly and steadily downwards into worrisome territory. At this point however the headline chosen for this entry might still seem rather alarmist but given the nature of lag of economic data relative to the present time I don't think that this question is entirely worthless to entertain. In this light, this entry should be seen as a small update relative to the large review and preview note on Japan posted recently here at GEM. This entry consequently gathers data from recent entries at Alpha.Sources as well as Japan Economy Watch to bring our readers fully up to date with the economic situation in Japan. 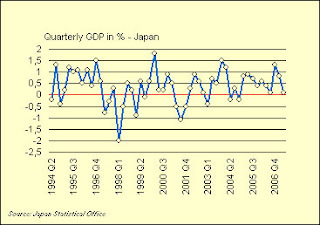 Let us begin with some simple charts which plots Japanese GDP in quarters as well as annually since 1995 so that we can get an idea of where were are. 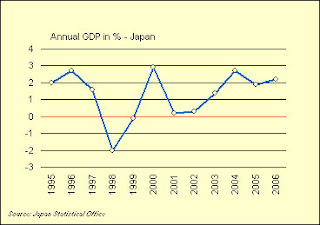 Based on the quarterly measures it is of course impossible to discern a trend but as we turn to the annual figures we can see how Japan indeed is currently enjoying what seems to be a persistent positive trend in GDP from 2001 and onwards. 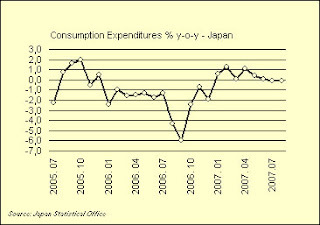 Yet, if we look at quarterly figures we can see that Japan in Q2 2007 was seriously flirting with the dreaded 0% mark (quarterly!) and with the recent revision of corporate capex we might even be looking at a contraction. This does not of course indicate that Japan is heading for a recession but it means that we are likely to enter a period where Japan very well could be flirting with the probability. 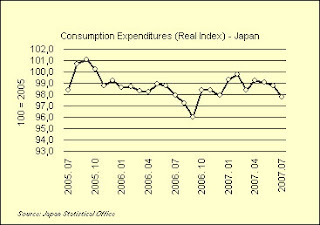 Moving further I present a quick extension of the short-term charts on prices and domestic consumption presented in the previous Japan note. As we can see, the trend continues with stagnating domestic demand as well as continuos and persistent deflation. Note in particular the core-of-core rate which slumped to -0.5%. Regarding household consumption the trend has been trending steadily down towards stagnation after beginning 2007 on a bright note. Finally and before I leave you I want to note two further aspects of the Japanese economy. The first relates to the much debated issues surrounding industrial production; Edward provides the relevant data and commentary here. It is still too early to say anything but it clearly seems that industrial production, while it has somehow abated on the back of the peak in Q4 2006, still is situated on a high ground relative to the beginning of 2006; the latest incoming data point show how industrial slipped slightly in July with -0.4% drop on a seasonally adjusted basis. As I have stressed before the gauge for industrial production is intimately related to the evolution of the trade surplus and in this context the mounting and lingering uncertainty surrounding the US and indeed global economy represents a notable downside from the point of view of corporate capex. In fact, if the recent downward revision of corporate capex is a sign of things to come we could be looking at a correction of industrial production which could fare well into H2 of 2007. This call is of course perfectly falsifiable since the future monthly readings will tell us what to expect. I don't quite think it is safe to lay out this rather bearish forecast but a second monthly decline in August would indicate, I think, that industrial production very well could begin to correct in the quarters to come. The second and thus final aspect I feel the need to note is the general tendency on the labour market where tightening continues alongside the trend of falling wages, something which of course runs counter to what we learn from economic textbooks. In stead of moving into a detailed assessment at this point I am taking a shortcut by pointing towards the recent analysis provided by Edward over at JEW. Conclusively, the following bullit points sums up the current trends in the Japanese economy all of them intimately related to the ageing of Japan's population as well as the ongoing turmoil in financial markets. Don't expect the BOJ to raise anytime soon. Of course and in terms of invesment decisions the traditional disclaimers apply but I honestly have a hard time seeing how the BOJ can justify a raise in this context even if Fukui is determined to finish his term on a sound footing whatever that means. Japan remains well entrenched in deflation and even though headline inflation (which in this case include food) is set to nudge up we should be looking at the underlying trend which is generated from domestic Japanese activity and thus the core-of-core index. Domestic consumption remains depressed. This does not mean that we are witnessing a secular decline but rather that the trend is low and overall negative. Increasingly, we also need to realize that whatever terms we apply to the current trend of domestic demand it does not conform with the idea of an economy being driven by internal dynamics. Regarding cyclical indicators downside risks seems to have emerged regarding the external demand for Japanese goods and thus also industrial production and more general corporate capex. 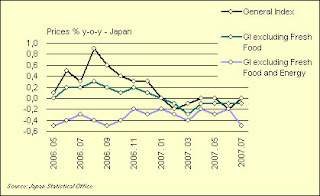 The main culprit here is of course the mounting uncertainty surrounding the strength of the US economy and with industrial production currently sitting on a high plateau Japanese growth rates are particularly sensitive at this point given the de-facto reliance on corporate investment as a derivative of net exports. Japan's labour market continue to defy conventional textbook wisdom as the ever declining unemployment rate fails to spur wage inflation. In fact, wages are now clearly set on a lingering downward trend on an aggregate basis. In order to come to grips with this fact and thus also in order to align expectations with reality we need to take a long hard look at Japan's population structure. I know this is indeed one of the recurring tedious claims of mine but it is equally as tedious to see how the discourse is not budging; even if this is not entirely true but there is still some distance to travel I would say. Finally Some Good News from Japan?